No Red Bow Ties After Labor Day. The Longest Week plays like a piece of Wes Anderson fan fiction, perhaps following a long lost Tenenbaum cousin. Only the names have been changed to protect the innocent. Homage isn’t accurate, and unoriginal is too kind a term to describe Peter Glanz’s Anderson approximation. It’s outright pilfering for the purpose of flexing pseudo-intellectual muscles. Several attempts at self-reference only call further attention to The Longest Week’s desperation and stretching to build some sort of redemptive theme out of the charade. There’s even a lighthearted lecture informing us that people who label something as pretentious are the turgid ones. Talk about pretentious. The unchecked, well-heeled lifestyle of heir Conrad Valmont (Jason Bateman) is threatened when his parents split. Forced to vacate the penthouse suite of his parents’ luxury hotel, the nearly 40-year-old, who’s been in the “gathering stages” of his novel for the last decade, relies on the kindness of friend Dylan (Billy Crudup) for lodging. 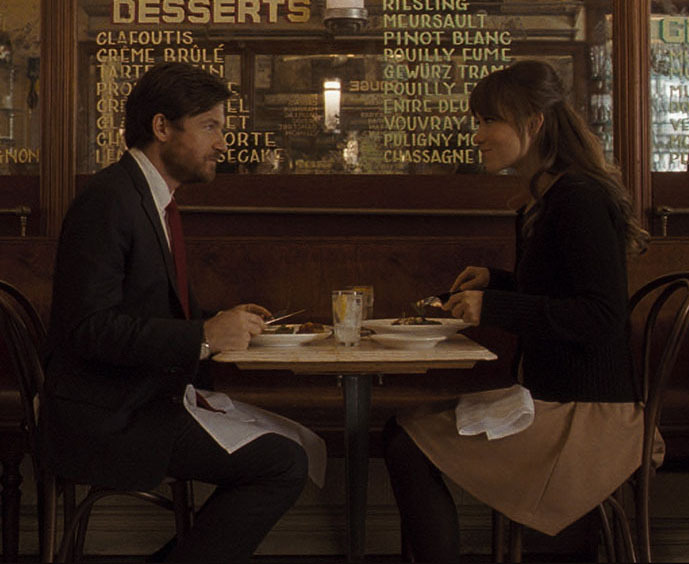 Things begin to look up for Conrad when he makes an immediate connection with beautiful Beatrice (Olivia Wilde) on the subway. But (wouldn’t ya know it) Beatrice is the model that Dylan is currently involved with, adding more complication to Conrad’s easy existence. A secret affair doesn’t stay secret for long, but the real threat to Conrad’s new relationship isn’t the friend he stabbed in the back, it’s his own naiveté. Neither romantic comedy nor a late arriving coming-of-age, The Longest Week is neither funny nor insightful. The central relationships are painted only with broad strokes and contain no stakes. Characters aren’t only unlikeable; they’re vapid to a point that borders on non-existent. Just because Beatrice is annoyed at vacuous model life and fancies Victorian literature doesn’t make her less culpable in the temporary embrace of Conrad’s questionable morality. Dylan offers his friend sketches of sound advice, but he’s just a cog in the socialite machine, selling art and attending fundraisers. It doesn’t matter who ends up with whom, or who learns what about real-world maturity because the triumvirate are merely statues to pose in designed wardrobes and soundboards for Glanz to champion his affected prose. His screenplay mirrors his subjects by being awfully garish without a lot of substance. Exacerbating the tedium is an ever-present, measured, and quasi-comical voiceover narration (by Larry Pine, who appeared in Wes Anderson’s Moonrise Kingdom and The Grand Budapest Hotel) that discusses Windsor knots and Tom Collinses, and also flat out tells us what characters are doing/thinking/feeling. It’s a choppy, grating refrain that disengages the viewer and chokes the actors’ ability to inject any personality into their ciphers. Also breaking up the protracted-feeling 85 minutes are title cards that count down the days of this long, long week. All this does is make us lament that we’re only up to Wednesday (or, sorry, “Mercredi” as the card tells us) and still have a few more days to plow through. Glanz’s appropriations aren’t limited to Anderson; there are healthy doses of Woody Allen as well, from the smooth jazz of the opening credits to the fetishizing of the singular being that is New York City. Frequent Allen collaborator Tony Roberts appears as a nonplussed psychiatrist who’s unable to calm Conrad’s quirks. Conrad just can’t help himself, and neither can Glanz, who never molds his transparent references into anything unique. The filmmaker even acknowledges this through winking, blunt third act analysis that includes terms like “derivative,” “inconsequential,” and “sophomoric” – as if to say the whole point of this twee effort is to prove how meaningless it is. In that case, job well done.